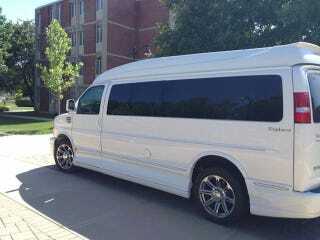 Jay Cutler showed up to Bears training camp today driving the vehicle you see above, what Jay calls a conversion van. Cutler made it very clear that this was not a mini-van, probably because he has spawned a whole brood of mini-Cutlers and a mini-van seems like a pretty sensible option for a dad. But it's a conversion van, not a dad-van. Can't you see Jay Cutler cruising around the 'hago—other people call Chicago that, right?—blasting Steppenwolf in his conversion van, while the kids sit 20 feet away, all the way in the back? [Head bobbing] "What's that? Blues Clues DVD?" [motions to ears] "I can't hear you." Definitely not a dad van, but aren't you falling in love with Jay Cutler all over again? His teammates are also down with the conversion van. Backup QB Jordan Palmer actually hitched a ride in the van and Matt Forte, despite his snooty automobile taste, hopes to check it out sometimes soon. Keep on vannin', Jay Cutler.